Michael Jordan once said: “Talent wins games, but teamwork and intelligence wins championships.” I guess we can all agree on that. Teamwork is important and it allows you to exchange ideas, work on big projects and follow through with goals that were established. A good team is never a coincidence. Working together requires a lot of work, both from a manager and team members. Good teamwork requires some basics as well, such as open communication, clear vision, and clear group roles. Teams around the world differ by management and communication styles. That’s why it’s always good to do a research and learn from the best companies out there. Harvard Business Review took a research to find out which factors can contribute to building collaborative teams. With the use of a range of statistical analyses, they considered more than 100 factors out of which they were able to isolate eight practices that correlated with success. These practices appeared to help teams substantially overcome the difficulties that were posed by size, long-distance communication, diversity and specialization. Then, to find out how they did it, they interview the teams that were strong in those practices. In this article I’ll appeal to some of them, for example the executive support, HR practices and the strengths of the team leader. But I will also recall some that I think are important. The inevitable step in building an effective team is for each member of the team to get to know each other – but not only by their names. The thing is to get to know somebody’s values, goals, strengths and the way they work. Once you will know your teammates like that, it will be easier to define how to work together best. At Nokia, when the employee starts a new job, their manager gives them a list of all the people in the organization. The list includes people that would be important in the work process later, no matter in what location they work on a daily basis. The managers explain the new person what topics they should discuss with these people and why relationships with them are important. So the newcomers lately set up meetings with people on the list, even if it means traveling to other areas. It’s what they call the gift of time – in the form of hours spent on coaching and building networks – and what is crucial to the collaborative culture at Nokia. When the team members know each other well, they should start working towards one goal. Are we sure that everyone in the team sees the goal in the same way? And if so, do they know how to achieve it? It often happens that team members have different visions about the result, even though they know how to get there. To explain it better, let me give you an example. My friend took a part in a big project. Its goal was to renew their internet browser which basically meant they had to design a new one. The team consisted of a researcher, graphic designer, UX designer and programmers. Each of them knew what they were supposed to do. They were to create an innovative, nice looking browser. What happened is that, along the way, it turned out they all understood “innovative,” and “nice looking” in a completely different way. To come up with the common vision, they decided to bring pictures that describes their vision of the browser and put them on the table. It turned out that some of them saw it as a browser for chilled and relaxed young people, some of them found it more official. 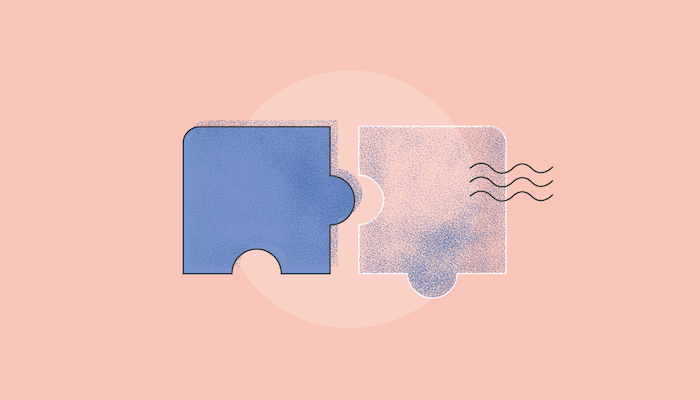 As you can imagine, it’s hard to work toward one common goal with totally different visions, so they discussed everything and came to an agreement. After the discussion, people started to chose other people’s pictures to show how the browser can look like. So they reduced the number of pictures that described the browser and worked out a common vision. Since then, the work speed up and everyone knew in what direction they should be all going. Without a clear vision like this, they would probably encounter a lot of misunderstandings in a subject so sensitive as design. Once the vision is set, it is crucial to work on team formations and structure. Newly formed teams are forced to invest significant time and effort into building trusting relationships. Not only it’s important to define approach toward achieving a goal but it’s also important to clearly specify roles for individual team members. Collaboration improves when the roles of individual team members are clearly defined and well understood. Once that happens, people feel that they can do a significant portion of their work independently. They can focus on what they do best and other team members can rely on them in this case. Individual work is as important as teamwork itself. In LiveChat, for example, we believe that “teamwork” is a value that allows us to work on the best live chat tool (you don’t’ have to believe me, you can test it for yourself) and still enjoy what we do. We have our creative independence and it makes us easy to collaborate with others. The authors of a research done for Harvard Business Review found out that some teams had a collaborative culture but were not skilled in the practice of collaboration itself. They were encouraged to cooperate, they wanted to cooperate, but they didn’t know how to work together in teams very well. By training employees in those areas, a company’s human resources or corporate learning department can make an huge difference in team’s performance. PwC’s training includes modules that address teamwork, emotional intelligence, networking, managing difficult conversations, coaching, corporate social responsibility, and communicating the firm’s strategy and shared values. PwC also teaches employees how to effectively influence others and build healthy partnerships. Bill Marriott, the chairman of Marriott corporation, runs his own blog. In this blog he discusses a range of topics, from Marriott’s efforts in becoming greener, to his favourite holiday spots. His blog is very popular among employees and it supports the idea that the company is a community. I, too, think it works. That’s just one idea. The other one is a very popular lately – creating big office spaces, indoor atrium or even the campus. 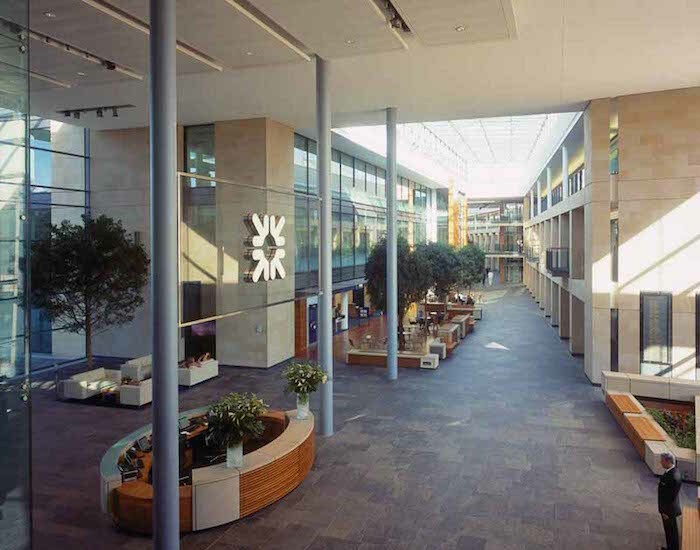 Just like a small town, with retail shops, restaurants and jogging tracks – something like Fred Goodwin, CEO of Royal Bank of Scotland did. It helps employees to remain on the campus throughout the day. It also improves communication among them, increases exchange of ideas and creates a sense of community. It turns out that the most productive and innovative teams are lead by people who are both task- and relationship-oriented. I guess there’s no surprise that the mix of these two skills is highly desired by employees. But what’s essential is that these leaders change their style during the project. At the beginning, when there’s a time for setting up goals and clarifying responsibilities for each team member, leaders are task oriented. At some point during the work on the project, they switch to more relationship–oriented style. This change usually happens when the team has achieved its goals and the initial tensions around sharing knowledge starts to appear. To improve their task leadership, many people at Marriott participated in project-management certification programs, taking refreshing courses to maintain their skills over time. Evidence of both kinds of capabilities become a significant criterion on which people are selected for key leadership roles at the company. There’s a lot you can gain by working together as a team. When working on a project, there are usually many people with different skills required. The important thing is to create a smooth flow between these people, which will allow them to exchange their ideas and utilize each other’s abilities. What’s crucial along the way is to not only keep clear communication and motivate each other, but also give each other space to develop individual’s skills. Later on you can gather them and perform top–notch work. Did you like this post? You might also be interested in checking out The Most Creative Meet the Team Pages.